Very often we, as fishermen, fall into a target species, marketing pigeonhole. 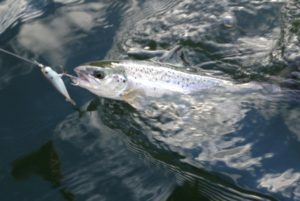 A particular lure is marketed or gains notoriety for one type of fishing, and we resist trying it for other types of fishing. 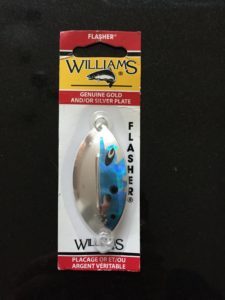 I’ve heard it over and over at fishing expos, “Is this a saltwater lure?”, or “Isn’t that a bass lure?’ Just because the label implies one thing, doesn’t mean it is not equally applicable for another presentation. Fish don’t read labels or watch TV. They eat smaller fish – that’s mostly what they do. 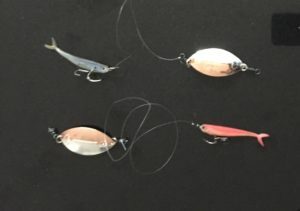 With that in mind, here is an excellent multi-species trolling rig using a lure better known as a dropshot offering for bass. 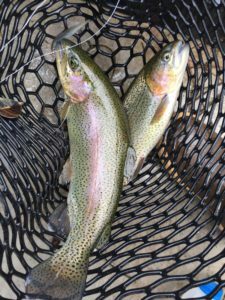 A double of Hawg Shad rainbows. 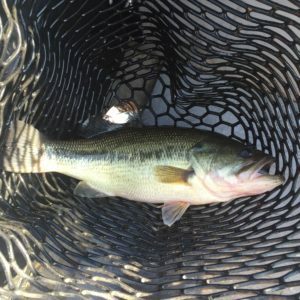 Start with either a 3.5″ or 2.8″ Hawg Shad and rig as described in the March 2016 post: “Keeper Rigging Small Plastics”. The supple plastic and remarkable color patterns make the Hawg Shad the perfect choice for this rig. 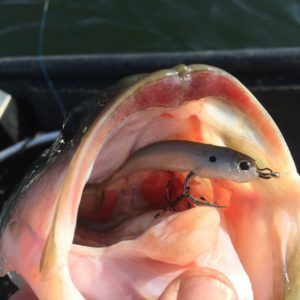 Connect the “Keeper Rigged” Hawg Shad to a wobbler with 10 to 20 inches of mono or fluorocarbon. The wobbler has no hooks. 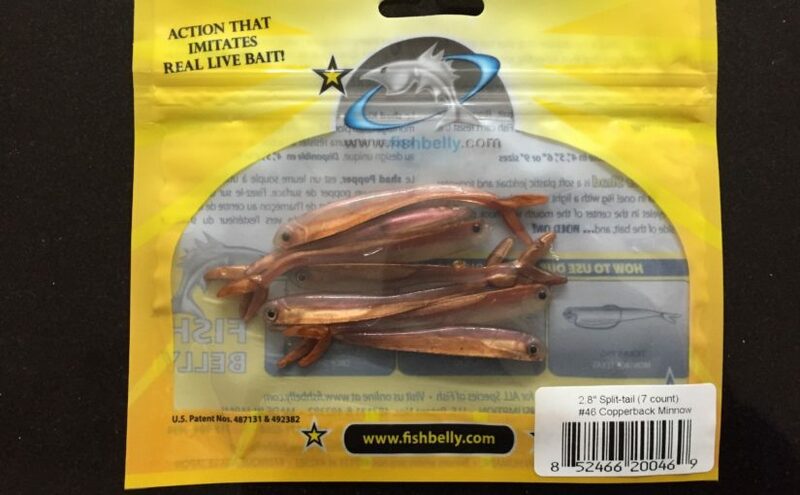 It functions as an attractor and enhancer for the hook bait. The shorter the leader, the more aggressively your Hawg Shad will move. Conversely, longer leaders create a more subtle action. Different brands go by different names such as; Wobbler, Wabbler, or Flasher. I’ve been using the F1 Flasher from Williams. It’s an eliptical spoon that measures about 2.75″ long. I like to add a ball bearing swivel on each end of the spoon to reduce possible line twist. This is a slow trolling rig. It is ideal for electric motor, row, or paddle trolling. You want a side to side swing action – not a spin. 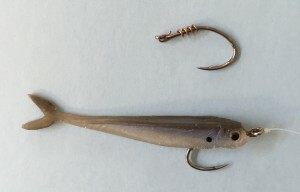 The wobble and swing makes the Hawg Shad dart from side to side like a fleeing minnow. The wobbler adds extra flash and vibration as well as imparting the action to the Hawg Shad. 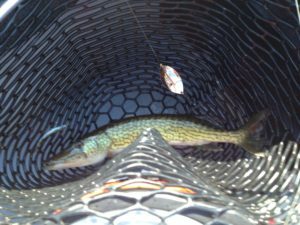 …and so do chain pickerel, the ever-present bonus fish.